SAT-IP technology doesn’t require complete upgrade to home network. You can continue to use existing satellite dishes. The central element is SAT-IP server technology, which is connected to a television receiver. This server accepts the program and television packs data into IP-packets. 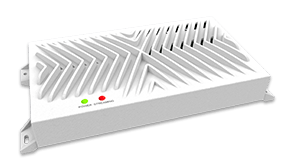 It sends them to the network through a router, and further the device via a LAN or Wi-Fi. SAT-IP transmits two types of data. Control devices are UPnP standarts .Commands are sent through RTSP (Realtime Streaming Protosol – streaming real-time protocol). Protection provided by the transfer of the TV stream through RTP (Real Time Protocol, Real Time Protocol) or HTTP. Data packets are packed and forwarded via UDP or TCP / IP. Contact: The application program or PC server (management standart), sent a TV stream (level of protection). Streaming: The server uses the SAT-IP protocol for RTP transmission. It is sent over HTTP to display. 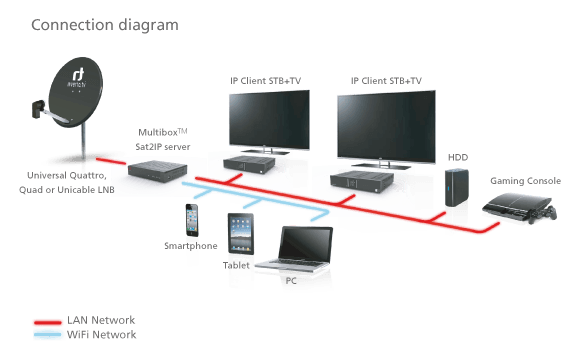 Addressing: It doesn’t matter whether TV stream passes through WLAN or LAN, IP delivers it correctly. SAT-IP Data packets, are transmitted as transport streams (TS) fragments MPEG 2/4 to 188 bytes. Flows headers RTP, UDP and IP packet data form one size of 1356 bytes. SAT-IP Devices, are standard can be combined from different manufacturers. Some models, Elgato Sat-IP, EyeTV Netstream 4Sat, integrated hardware transcoder. It doesn’t matter whether you are using a digital device LNB or multiswitch (apartment building). AVM FritzBox 6490 distributed for apartments. Both options only transmit unencrypted TV programs. Conventional satellite antenna sends a signal to the receiver via coaxial cable. With SAT-IP TV works without problems and over WLAN. Able to watch digital satellite TV in various locations apartment or house requires time-consuming networking multiple devices .Reason: every television reception device must be connected to a satellite dish with coaxial cable. Such a complex association news already out of date: a few years ago was prodemon cule such a decision, as EyeTV Netstream from Elgato. The digital television signal is fed through a server over home network. After that, via LAN or Wi-Fi, which have become commonplace in many homes, TV signals are transmitted to terminal equipment. These devices for computers, tablets and smartphones. Until now, there was such a problem as lack Elgato and other common standard for manufacturers IP-flow “live TV”. Instead been invented their own solutions for streaming. Thus, it was not possible to combine different device manufacturers, and even when one apparatus of adherence results in most cases are not pleasing. With SAT-IP protocol appeared (European standard 50585: 2014), is integrated into the home network even TV with HD resolution. SAT-IP protocol is supported not only satellite TV, but also cable and ether (DVB-C and DVB-T). SAT-IP technology is also referred to as converter DVB-IP. This server is located directly behind the TV and the receiver is attached, for example, to a digital LNB (Low Noise Block Converter low-noise-piece) satellite dish or multiswitch. Under the hood is hidden a few high-tuners. Currently popular in the market are servers SAT-IP. having from two to eight tuners. Tuners demodulated television signal, which is the next stage in the packaged IP-packet and transmitted further. Each tuner, under standard SAT-IP, can provide support as a client (Unicast), and simultaneously to send a television program on a plurality of receiving devices (Multicast). In this case, the data stream Live-TV remains intact. There are two servers in which is embedded hardware transcoder that extends the functionality and not a mandatory component SAT-IP standard. SAT-IP standard doesn’t have limit of transmitted data quality! The home network SAT-IP protocol works on streaming DLNA, divided into two levels: the level of the medium through which data packets are transmitted Live- TV and management level, through which request access device. In the presence of SAT-IP, nothing happens until something is not requested by the client if your device runs the client, it searches the network for available SAT-IP servers. In most cases, the servers and clients must have appropriate IP-addresses. Socket IP-address lookup server should automatically work through SSDP (Simple Service Discovery Protocol, a simple discovery protocol servers), because each server registers included in the network. By the way, the standard SAT-IP default network provides multiple servers SAT-IP. non-contradictory. If the client and server are each other’s customers may request in currents. This is a standard protocol provides a classic HTTP or configured for streaming RTSP (Realtime Streaming Protosol). After play request from a client requests a certain gray-faith television program.